Use 1 capful (5 mL) for each 200 L (50 US gallons) or as required to maintain about 0.10 mg/L iron. For smaller doses please note that each cap thread is about 1 mL. Use MultiTest™ Iron test kit to monitor iron concentrations. Due to rapid utilization, test within 30 minutes. Use as needed to combat signs of iron deficiency (usually seen in new growth) which include: chlorosis (yellowing) of tissue between veins and short and slender stems. Why do I need to use Flourish Iron™ if I’m already using Flourish®? A: Iron is an important nutrient in the planted aquarium. In order to maintain an adequate iron concentration it should be dosed on a fairly regular basis (daily). Flourish® should be dosed less often (semi-weekly or weekly) since its components are not rapidly depleted. Daily dosing with Flourish® can lead to unwanted algae growth. By having these supplements as separate products, the hobbyist can add Flourish Iron™ every day and not risk unwanted algae growth while still adding the necessary level of Flourish® on a less regular basis. An hour after adding Flourish Iron™ to my aquarium I do not get a reading with my iron test kit. Are the plants using the iron or is it precipitating out somehow? A: I am confident that the iron is being consumed. If it was precipitating out of solution, you would notice a white chalky haze to your water and a white colored coating to your aquarium walls, heater, filter, etc. Our Flourish Iron™ is a very different type of iron. Our's is bound to a carbohydrate that is very easily metabolized by your plants. Most of the others on the market are chelated iron supplements and your plants has to expend large amounts of energy to get the iron from the chelate to be able to use it. When I add Flourish Iron™ to my aquarium within a few minutes the water gets very cloudy. What is causing the precipitation? A: This is a peculiar response. 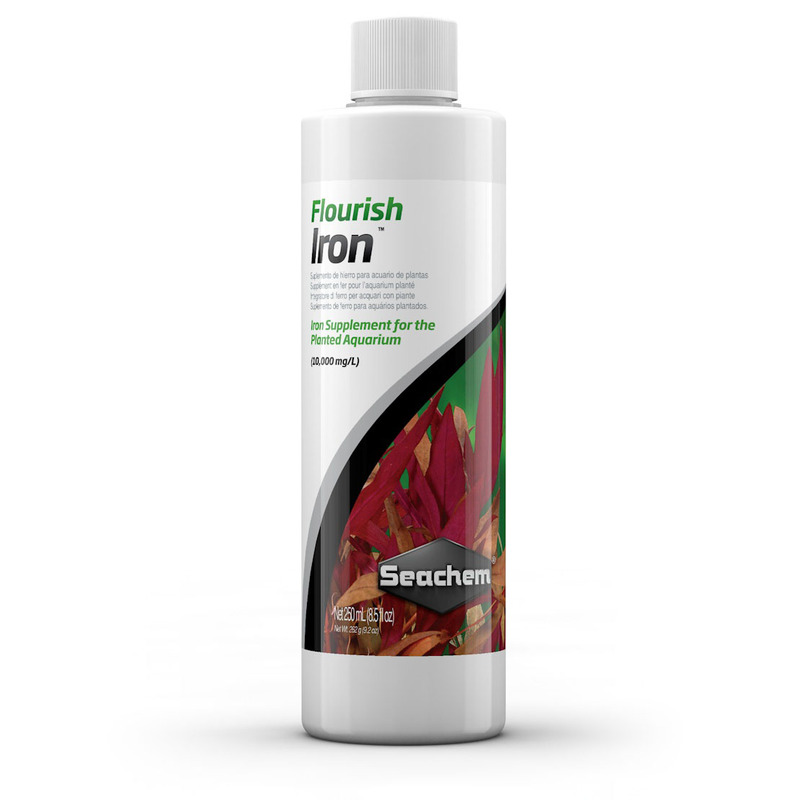 Flourish Iron™ does not normally cause cloudiness unless used excessively, and even then the cloudiness is very mild. Since the cloudiness was caused by a white precipitate, as you confirmed by testing, it is not an iron precipitate. It is also unlikely to be a direct carbonate precipitate. I suspect that your water is exceptionally hard (contains a lot of calcium/magnesium) and that you may also have a high alkalinity (carbonate content), and that the addition of Flourish Iron™ (by an ion competing mechanism) pushes the calcium/magnesium carbonate in the water beyond saturation, resulting in the precipitation of calcium/magnesium carbonates. Even without the addition of Flourish Iron™, do you sometimes see a white (chalky) film on the surface of the water? If so, that would support the presence of high calcium/magnesium. You may want to test your water for calcium/magnesium and alkalinity. If you experience problems growing certain plants, that may also suggest excessive hardness, since many plants prefer soft to only mildly hard water. Do you see any cloudiness when adding bicarbonate? If you have to frequently add bicarbonate, you may be using to much CO2. Regardless, however, I expect your calcium/magnesium hardness is the culprit. While this is nothing to panic about, if it should prove to be the case, I think you would do better to dilute out your water with some kind of soft water, such as DI, RO, or rain water.